'Enough,' Says Giffords As She Launches Campaign For New Gun Laws : The Two-Way When children are gunned down in their classrooms, the former congresswoman says, it's time for change. Two years ago, she was shot and seriously wounded by a gunman who went on to kill six people and wound another 12. 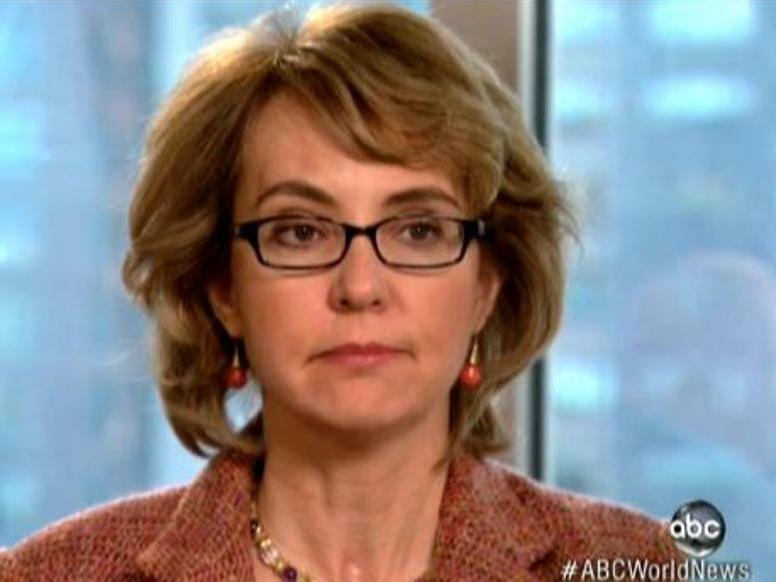 When children are gunned down in their classrooms, as happened last month in Newtown, Conn., it's time to say "enough," former Rep. Gabrielle Giffords, D-Ariz., tells ABC News. Former Rep. Gabrielle Giffords, D-Ariz., during her interview with ABC's Diane Sawyer. So she and her husband Mark Kelly, as they write this morning in USA Today, are launching a campaign "to balance the influence of the gun lobby" and push for "responsible changes in our laws to require responsible gun ownership and reduce gun violence." Their announcement comes two years to the day after Giffords was shot in the head by a gunman who attacked an event she was hosting in Tucson, Ariz. he killed six people and wounded 13, including the congresswoman. "Two years ago, a mentally ill young man shot me in the head, killed six of my constituents, and wounded 12 others. Since that terrible day, America has seen 11 more mass shootings — but no response from Congress to prevent gun violence. After the massacre of 20 children and six of their teachers at Sandy Hook Elementary though, it's clear: This time must be different. "Americans for Responsible Solutions will encourage elected officials to stand up for solutions to prevent gun violence and protect responsible gun ownership by communicating directly with the constituents that elect them." "Forget the boogeyman of big, bad government coming to dispossess you of your firearms. As a Western woman and a Persian Gulf War combat veteran [Kelly] who have exercised our Second Amendment rights, we don't want to take away your guns any more than we want to give up the two guns we have locked in a safe at home. What we do want is what the majority of NRA members and other Americans want: responsible changes in our laws to require responsible gun ownership and reduce gun violence." Much more from the ABC interview with Giffords and Kelly is due on Tuesday evening's World News with Diane Sawyer. Giffords and Kelly visited families of the Newtown victims last week. A local state legislator is apologizing for having posted a message on Facebook that urged Giffords to "stay out of my towns."